So, here we are, folks! We have arrived at the worst episode of Gilmore Girls ever to air. I’m not counting the seventh season, but apart from that, this one really sticks out like a sore thumb. Sure, I’ve knocked a few of these early second season episodes, but by and large, they ain’t bad. A little annoying maybe, but “Secrets And Loans” is essentially plotless and extremely stressful, and it has no right to be either. It invents a problem and solves it within 40 minutes and it’s pretty much never heard of again. So, Lorelai has termites. She wakes up one morning and she has termites! Termites in her house. Kirk estimates the damage at $15,000. The rest of the episode is spent with Lorelai trying to get a bank loan. Yes, it’s scintillating stuff, guys. See, Lorelai can’t get a bank loan, but she needs to get a bank loan, to solve this termite problem. The termite problem that just presented itself. It’s not very dramatically compelling to begin with and it also doesn’t bring out the best in Lorelai. Her nervousness at having to pay $15,000 to fix her house is understandable. And she’s wise to turn down a loan offer from Luke (who will let her pay him back anytime) so as not to corrupt their friendship. But then Emily butts in, on Rory’s advice, and everyone gets into boring old fights we’ve seen a million times before. Lorelai doesn’t like Rory meddling. She doesn’t want Emily having something over her. It’s old hat! Emily is already helping Lorelai out. What difference does it really make if she co-signs on a loan? In an episode with such a flaccid A-story, you might hope for something fun in Rory’s adventures, but no, instead we get another weird fight out of nowhere concerning Lane becoming a cheerleader. Rory is ridiculously offended to discover this and Lane is ridiculously defensive and it’s really not in character for either of them and it’s resolved almost immediately to the extent that it will never be mentioned again. I’d say this was a bottle episode, but it’s not, because there’s a whole bank set that Lorelai visits I’m sure we never see again. “Then there’s basketball uniforms and cheerleading set to One Step Beyond. So that’s something?” That’s what I wrote in my notes to summarize the last five minutes of this episode. It’s not that the Lane-choreographed routine isn’t cute. It’s just that the story of this episode doesn’t remotely flow together. Luckily, as I said, it really is the worst episode the show ever aired under the Amy Sherman-Palladino era. Everyone’s allowed one total misfire. Now I can stop my complaining. “Richard In Stars Hollow” has its faults, mostly revolving around the sometimes inconsistent portrayal of the Gilmore patriarch. But it’s also an episode doing its best to address those problems and explore his character as he struggles with retirement and the loss of identity that comes with it. Richard has worked his whole life and prides himself on being a provider, and his marriage with Emily is, of course, highly traditional—he brings home the bacon, she manages the household, they eat dinner together and go to functions, coupled with the occasional trip. With Richard retired, he’s suddenly noticing things he never had cause to notice before, like Emily’s morning habit of drinking coffee, and he’s showing an interest in things no late middle-aged man should show an interest in, like Emily’s water aerobics class. Needless to say, it’s driving her bonkers. 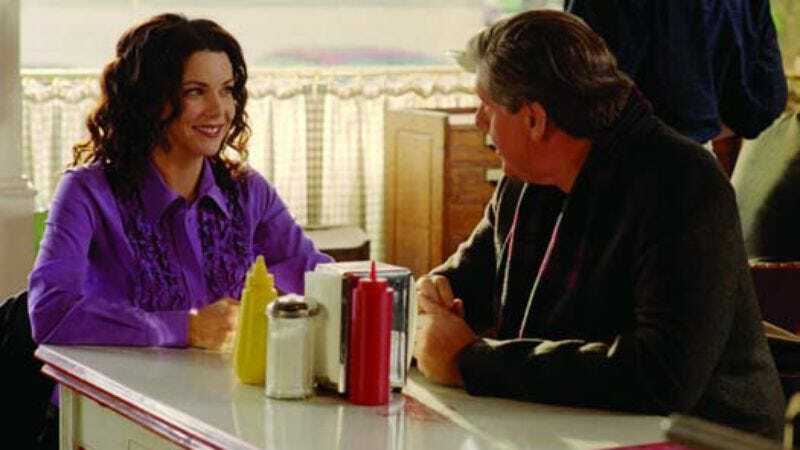 So Emily insists Lorelai take her father around Stars Hollow for the day, just to get him out of her hair (which is worked on weekly, by the way). As previously explored in “Forgiveness And Stuff,” this is possibly the most strained relationship in the Gilmore clan. Sure, Emily and Lorelai’s relationship is a little more loaded, more prone to explosiveness. But Richard and Lorelai barely even seem to have anything in common. My problem with this episode is how ridiculously judgmental Richard is throughout. It’s not like we haven’t seen this from him before—the best example being his high-and-mighty interrogation of Dean, which continues this week (with better results). But it always comes a little out of nowhere, and it’s especially relentless here. At one point, Richard gives Lorelai a dressing-down at work over a flirty phone call to her linen guy. It’s absurdly patronizing and a little too old-fashioned, even for stuffy old Richard, but Lauren Graham kills it with her reaction—barely-disguised fury mixed with a daughter’s shame at being chastised by her father. Some of Richard’s objections are a little more reasonable. It makes sense to me that he’d be alarmed at the prospect of Rory driving a car designed and built by a 16-year-old boy. Lorelai is weirdly blasé about the whole thing (although she certainly knows Dean well enough to trust his judgment). And his final rant to his daughter, where he points out this is the first time she’s invited him to her house (at the begging of her mother) lands very nicely. The B-story with Paris looking for Stars Hollow’s seedy underbelly is silly to say the least. But it’s really the first in what will be many stories centered around Paris acting silly and dragging an alarmed-looking Rory with her. This is one of my favorite dynamics on the show and it’s nice to know we’re out of the whole Paris/Rory tension phase. Plus, this is the first episode with Gypsy (Rose Abdoo). I love Gypsy! She’s so funny! Emily’s morbid discussion of the family mausoleum is a highlight, especially when Lorelai and Richard agree on Aunt Cecile’s terrible jokes.